What are the misspellings for play? What are the common mistypes for play? What does the abbreviation play mean? 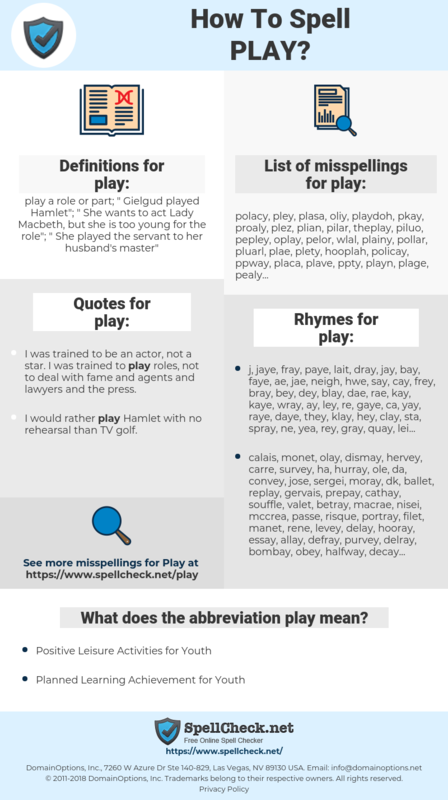 What are the quotes for play? What are the rhymes for play? What are the translations for play? 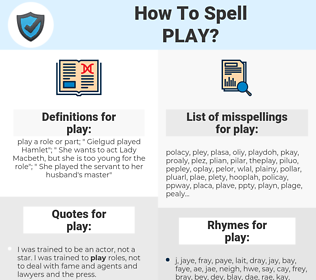 What are the common typos for play? play a role or part; "Gielgud played Hamlet"; "She wants to act Lady Macbeth, but she is too young for the role"; "She played the servant to her husband's master"
This graph shows how "play" have occurred between 1800 and 2008 in a corpus of English books. I was trained to be an actor, not a star. I was trained to play roles, not to deal with fame and agents and lawyers and the press. I would rather play Hamlet with no rehearsal than TV golf. In the past, I have not been able to hear myself. I play with feeling so I need to hear what is coming out of the amplifier to inspire me; I don't just play mechanically. I did a play called Throne of Straw when I was 11, at the Odyssey Theatre in Los Angeles. It became really clear to me at that point that I enjoyed acting more than any other experience I was having. I play music a lot but on my own mostly, so it was nice to be around other people. There was a certain sense a relief in the physical act of just playing and being with other musicians. 玩, 播放, 演, 游戏, 演奏, 扮演, 玩儿, 般乐, 嬉耍, 抏, 耍子. draaien, spel, spuiten, inzetten, opvoeren, flikkeren, beurt, stuk, uitvoeren, spelen, bespelen, toneelstuk, afspelen, gokken, opstellen, uithalen, zich vrij bewegen, uitspelen, aan zet zijn, glinsteren. passer, mettre, jeu, jouer, simuler, jouer à, jouer de, pièce de théâtre, plaisanter. Spielraum, Spiel, ausspielen, spielen, abspielen, Spielzug, mimen, mitspielen, musizieren, aufspielen, nachspielen, blasen, werken, Theaterstück, Schauspiel, Drama, Spielweise, Play, Bühnenstück, Lagerspiel, Theaterschauspiel. gioco, divertimento, giocare, suonare, spettacolo teatrale. プレイ, プレー, 芝居, 劇, 戯曲, 遊戯, 手遊び, 演ずる, ドラマ, えんげき, 演戯, たわむれる, あそぶ, 演る, しばい, てあそび, どち狂う, えんずる, ぎきょく. jogar, desempenhar, executar, atuar, jogo, peça, brincadeira, reproduzir, peça teatral. играть, прикидываться, притворяться, спектакль, пьеса, резвиться, забавляться. poner, juego, participar, disputar, emitir, dirigir, mover, actuar, tocar, interpretar, representar, ejecutar, correr, competir, apostar, ocio, fingir, jugar, reproducir, juguetear, obra, sonar, brincar, jugada, ejercer, pieza, bromear, encarnar, holgura, hacer de.